The seeds of present tensions and conflicts – recently exploding into a tumultuous movement against the Citizenship Act Amendment Bill – had been sown deliberately in colonial times. It is a pity that some people are going all-out to dismiss the National Register of Citizens (NRC) in Assam with thin arguments, apparently armed with selective history and socio-economic criteria divorced from the concrete social and political history of India’s Northeast. Western liberal theories must not be borrowed for application in a decontextualised manner to explain issues of the Indian Subcontinent, and, specifically, those of the Northeast. A tactical ploy colouring this kind of narrative is a flat denial of the role of colonialism in shaping the circumstances that still keep the region subject to periodic convulsions. Any serious student who has closely studied the problems of this region realises that the seeds of the present tensions and conflicts – recently exploding into a tumultuous, region-wide movement against the Citizenship Act Amendment Bill – had been sown in colonial times deliberately, and aggravated by other, later factors; they are becoming almost intractable. The only way out of this menacing situation is for all parties to sit together and negotiate a viable democratic solution to the complex problem – perhaps to be implemented in phases. Completion of the NRC could be part of it. Otherwise, as I have pointed out many times, the region will be caught up in an unending series of bitter and bloody conflicts leading to periodic massacres and human tragedies. This is bound to involve concessions and compromises. Any approach leaving the solution to armed intervention by the state or some future ‘revolutionary’ regime will be tantamount to arrant cynicism. This necessarily includes the perception that unresolved questions for the region are part of the can of worms we have inherited. Using lofty academic condescension to dismiss them as garbage will only betray a lack of maturity in handling complex socio-political issues. I feel compelled to add that the current concerted move in certain academic circles to erase colonialism from the consciousness of the people in dependent countries appears to me a part of a global plan to obscure the neo-colonial role of world capital today. Furthermore, we can only overcome this lethal legacy with a ceaseless struggle to spread and deepen democratic ideas and values – both in social movements and academic culture. True, such nations or nationalities also bear within them elements of class conflict and various other forms of social oppression, but these cannot be overcome in a vacuum without coming to terms with national questions. It is one thing to prescribe programmes for the oppressed from a safe academic distance and quite another to work them out in close touch with those in the throes of democratic social movements in concrete situations. Let me give here a brief resume of the salient facts I have treated elsewhere in greater detail. In the early decades of the nineteenth century, the British seized the kingdom of Assam from Burma (present-day Myanmar),which had occupied it following a devastating civil war. They also invaded and occupied various other adjacent kingdoms and hill-tracts inhabited by free tribes, and joined them together to form the province of Assam under the colonial Indian Empire. There was no logical historical rationale for this political arrangement except the convenience of colonial exploitation of resources of the region and an administrative arrangement suited to that end. In order to facilitate the processes of exploitation, immense numbers of people were imported within a few decades as labour for colonial plantations, farmers for revenue exploitation and assistants for clerical and technical work. Migration continued even after needs of colonial rulers had been met and the number of immigrants rose to be equal to, if not larger than, that of the indigenous people. The migrants found in Assam tribal groups used to primitive shifting cultivation across extensive fertile areas to sustain their livelihood, and subsistence peasants pauperised by colonial rack-renting, becoming landless due to heavy indebtedness. Some were tempted to take advantage of their weakness. And, of course, there was not the least bit of concern on part of the colonial rulers regarding whether this demographic imposition might lead to future conflicts and complications. The irony is that neither the indigenes nor the immigrants have ever questioned the role of colonialism in bringing them to this kind of impasse. At various stages of social development, those various groups of new settlers remained apart from natives and seldom thought of building bridges with them – with some exceptions. Passive objects of colonial policy, they remained content to function within the security of colonial rule and law. Among them, Bengali Hindus were ahead of the others in their adaptation to modernity and development of national identity. They were conscious of their advantage and treated the local people with some hauteur. Again, there were exceptions. Bengali Muslim peasants remained largely outside the process of the development of Bengali national consciousness and, from the 1920s to the 1940s, got drawn into the mass assertion of a separate Muslim identity and demanded the merger of Assam with the proposed state of Pakistan. While driven by desperately poor landless peasants’ desire for land, this call for Pakistan greatly alarmed the natives of different communities. Suspicions against immigrant Muslims lingered long afterwards, even triggering sporadic violence against them in Kamrup district in the early 1950s. A fairly long process of negotiation between their leaders and the Assamese leaders gradually reduced tensions, especially after they accepted Assamese as the medium of instruction in new schools founded by them and agreed to declare Assamese as their mother tongue in censuses. However, unfair it sounds, it was the only way to overcome obstinate prejudice and carry on with normal life. There are today prosperous farmers, businessmen, government officers, lawyers and doctors among them and many have become known writers in Assamese. 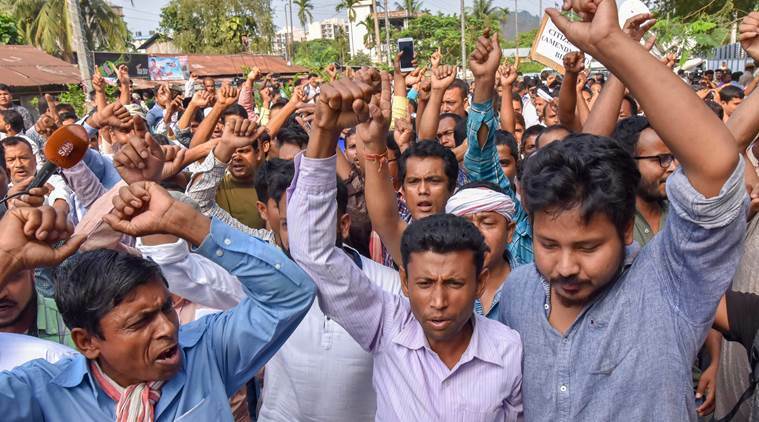 Even so, some Assamese chauvinists still voice alarmist fears about their role from time to time, especially since the Assam Movement, when the RSS surreptitiously entered public life and discourse in Assam. This is very much a colonial legacy and it is still bedeviling our social and political life, which is more than a sum of class and caste factors. There had been friction with Bengali Hindus, with its own unpleasant aspects, on the question of language too. But it weakened after Assamese became the official language of the state, with Bengali as an associate official language in Barak valley in 1960. People moved on. It needs to be recalled that, on this issue, the Bengali immigrant Muslims sided wholeheartedly with the Assamese. The Assamese middle class played the leading part in all these events. The Assam Movement, which dragged on for six years and was covertly manipulated by RSS elements stoking old prejudices into burning hatred, led to recurrent violence – reaching an horrific climax at Nellie. The immigrant Muslims were so scarred by such events that they refused to accept the Assam Accord, which set the date to determine citizenship on March 25, 1971. But the mutual suspicion and hostility led to a complete breakdown of the social contract and the situation was further aggravated by the rise and spread of insurgency as well as the ham-handed military response to it by the state. he demand for an NRC settling once for all the vexed issue of citizenship was then accepted by all, with the exception of some die-hards. Hence, the NRC is not some vicious plot against people of immigrant origin, though the BJP and the RSS have lately been hard at work to make it just that. Questions have been raised about the class interests of the regionally dominant middle class – and justly so. In this connection, a remark of mine on its role as the Centre’s agent in suppressing aspirations of smaller and weaker ethnic groups and nationalities has been quoted from an article of mine published in 1981. However, it is on record that I revised my views by 1982 sufficiently to consider the Assamese themselves as victims of the Centre’s policies, adopted in the interest of Indian ruling classes (see Assam, A Burning Question, Guwahati, 1984). Instead of real economic development for people racked by colonial plunder, after independence too, they had been fobbed off with short-term benefits and the lure of power. The colonial pattern of plunder and dependency characterises its economy even today, with the successor state and Indian ruling classes more or less playing roles similar to those of colonial rulers. This is not to deny its own oppressive role, which has now been weakened considerably by tribal resistance – with the Centre sometimes playing the honest broker. In this complex situation, greater and wider extension of democracy through tough negotiations appears to be the only fruitful approach as the alternative to protracted and wasteful violence. The national question (also involving honest acceptance of the federal element in the constitution) thus casts its shadow, much as some people might like to wish it away by mouthing academic formulas. Let us face it. Mindsets developed during that long colonial chapter in the country’s history not only fuel major communal and venomous narratives today, but are also haunting regional discourses and politics. The middle class is composed of both accomplices of this plunder and potentially democratic, deprived elements. In the absence of a powerful ideology making due allowance for national aspirations, the latter may become unwitting agents of fascist reaction. Let me make it clear that the word ‘immigrant’ holds no toxic association for me, as it might for some. It simply encapsulates a political and social reality. Immigrants, over a long period of time, become natives – unless they resist this process consciously – while keeping some precious part of their own heritage intact. This has happened in India at large and also in Assam. But let me also call the unprejudiced reader’s attention to certain indisputable historical horrors. The US was settled in by multitudes of Europeans, most of them wretchedly poor labourers and petty traders or craftsmen, fleeing exploitation and oppression at home. But in the process, they drove millions of native Americans out of their homeland; they pillaged and massacred them to near-extinction. The Americans took a long time to look this truth in the face. Meanwhile, those atrocities got covered up in rich folklore about the heroic endurance, sacrifice, courage, hard work and incessant vigil against ‘savages’. In our student days, we used to lap all this up as legends of the Frontier and the staple of popular ‘Western’ films glorifying the shooting down of ‘red Indians’ by the dozen. In Israel, you have another example of poor and persecuted refugees and migrants from Europe turning on native Arabs – who in 1935 formed over 75% of the population of Palestine – and ruthlessly driving millions of them out of their ancient homeland with unbridled terror. That these migrants included some fervent socialists made no difference. Hence, let us not give unqualified and unconditional support to all migrants. Let us also not forget that the Bengali peasants had been the wretched victims of ruthless Zamindari exploitation under colonial laws and were exploding into unrest when the wily colonial rulers found a safety valve for maintaining their rule by opening the doors to Assam. Hindus from Bangladesh had later entered Assam as refugees – again as a result of the partition of the country, masterminded by colonial rulers. In our time, millions of Syrian refugees have sought shelter in Europe, wrenched out of their beloved hearths and homes by the continuation of Western colonial politics under the guise of extending the blessings of democracy. I am sorry if I cannot find sober, sanitised academic words for such horrors. A compassionate but careful approach to the complex, fraught issues left behind by colonialism and ignored by Indian rulers is therefore indispensable for resolving them. The development of a national (some choose to call it sub-national) consciousness and outlook in Assam took place in a colonial environment and consequently lacked the power to fulfil its aspirations for all-round growth out of the morass of colonial poverty and under-development. That is the reason why the Assamese middle class enthusiastically joined the Indian freedom movement and hoped to acquire through it the power and resources to build a strong and healthy nation in their homeland. Middle class leaders did go down to the villages and, by the 1920s, organised peasant masses into a pulsating mass movement. But thanks to wily British manipulations, Congress leaders got distracted into rivalries with Bengali Hindus and challenges from Muslim communal politics. They spent more time consumed with these intrigues than in alleviating the misery of the masses. Colonial constitutional reform afforded little scope for it. In the years after independence, there were initially sincere efforts to build a base for future development covering all sections of society – benefits of education were spread to different backward regions and medical and engineering colleges were built to train the youth for the task of national reconstruction. But the state government’s resources were small. Tea gardens did not pay income-tax and gave sales-tax to West Bengal because auctions took place in Kolkata. Oil was taken over by the Centre as early as 1948 and, for decades, Assam reaped little financial reward for oil extracted from its soil. Then corruption began to drain away much of what came by way of plan money, and the Assamese middle class grew rich on it while starting to neglect the rural poor and the tribals. However, the lower middle class still projected less complacent and popular democratic ideals. In my opinion, the concentration of planning and decision-making in Delhi harmed regions like Assam. The number of MPs it sent was too small to influence major policy decisions. And the business class from outside the state used development schemes in the state to their own advantage – sharing a fraction of the excess profit with the middle class. The poor and the tribals were gradually left in the lurch while a section of the enterprising, hard-working immigrant Muslims made the best of the new economic opportunities to improve their conditions without any assistance from the government. A striking event in 1957 should open the eyes of neutral observers to the nature of the situation. Under the leadership of socialists and communists, with covert support of the state government, a mass movement was organised – with tremendous popular participation – to force the Centre to build an oil refinery in Assam, which then accounted for the bulk of the oil produced in India. The people themselves had to compel the Centre to take a small step in starting modern industry in Assam and train local youth in the necessary skills for such work. Thus, the environment became inimical to the development of a modern economic outlook and common people began to depend more and more on government doles and leftovers from the general loot. A telltale example was plunder from so-called flood protection. Hundreds of kilometres of embankments were built with sub-standard materials and utter lack of proper scientific planning, leading to annual increases in flood ravages and loss of land, which was the sole support for sustenance of the rural population and unearned income for contractors, engineers and politicians. Such a situation could have been avoided had the state government been left with resources and power to take policy decisions for development. In the meantime, the Congress had become a highly centralised party in which regional forces had little weight. When regional forces held power in the state, they too were soon co-opted into the structure of power that decided allocation of resources and access to wealth. In this colonial-type situation, the common people could not depend on their own initiative and became utterly dependent on the government. Control of the government became the major contentious issue for communities and sectarian ideas, instead of democratic ones, struck deep roots – leaving a fertile soil for varieties of chauvinism. One fears the same scene is being played out in tribal-dominated states to the ultimate distress of the common people. However, it is an idle hope to pin one’s faith solely on class-based struggles and junk the national question. It is a necessary phase to settle it on the basis of ideas of social justice and widening of democracy. As we have seen, powerful all-India reactionary forces can intervene to spread discord and disorder to undermine this vital project. Scuttling the NRC under the cover of promoting subaltern classes and caste interests will, I repeat, drown the whole region in endless internecine conflict and lead to its engulfment by dark reactionary forces. Regional chauvinism has no problem in ganging up with bigger national forces that now assist ruthless corporate power. Democracy and social justice must be the main parts of our agenda today. Nationalism will remain relevant as long as neo-colonial onslaughts on the world’s poorer and backward peoples continue. The national question remains essential for unlocking progressive forces embedded in the people, provided democratic understanding and tolerance are accepted as proper conditions for success of the enterprise. 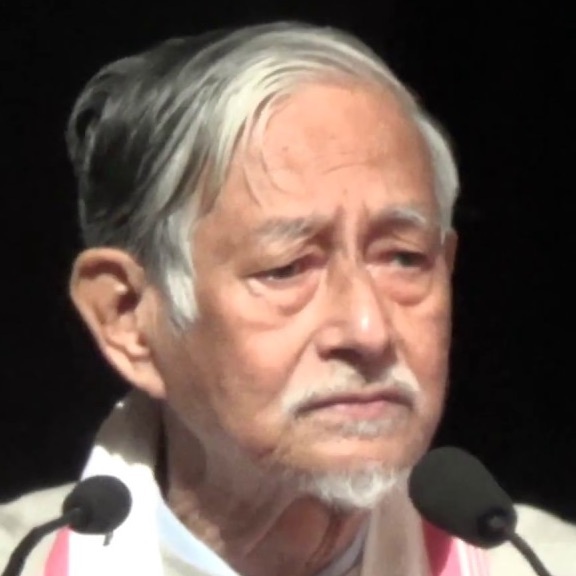 Hiren Gohain is a Guwahati-based scholar and intellectual.